COLRAIN — One of the longest-serving town clerk’s in the state, Judith D. Sullivan, died Saturday of cancer. Sullivan has been Colrain’s town clerk since 1969 when, at the age of 25, she temporarily filled in for Jeanette Tetrealt, who was leaving the town clerk job to get married. “I never attended a town meeting until I was a clerk at one,” she told The Recorder in 2006. Sullivan went on to hold many Town Hall jobs, including town treasurer, selectmen’s secretary, Conservation Commission clerk and Board of Health clerk. She became a justice of the peace in 1980 and has performed marriage ceremonies for hundreds of couples since then. Elected to 13 terms as town clerk, Sullivan was honored with a 40-year service pin by the Massachusetts Town Clerk’s Association last summer, but was unable to attend the annual conference because of her illness. In the fall, several town clerks from surrounding towns, including her sister, retired Charlemont Town Clerk Linda Wagner, presented her with the award at Sullivan’s home. Her colleague, Selectman Duane Scranton, has worked with Sullivan for almost 38 years, after he became a selectman for the first time in 1973. Calling hours for Sullivan will be Thursday from 6 to 8 p.m. at the Smith-Kelleher Funeral Home in Shelburne Falls. Funeral services will be Friday at 11 a.m., at the Colrain Community Church. Sullivan told her family before she died that she would like to be taken from the church to the West Branch Cemetery by way of horse and buggy, so that is what her family has arranged. For now, Treasurer/Tax Collector Leah C. Coburn is to temporarily serve as Colrain’s town clerk until the next election, Coburn said. A horse-drawn cortege for Town Clerk Judith Sullivan, who died Saturday, arrives at West Branch Cemetery in Colrain on Friday. 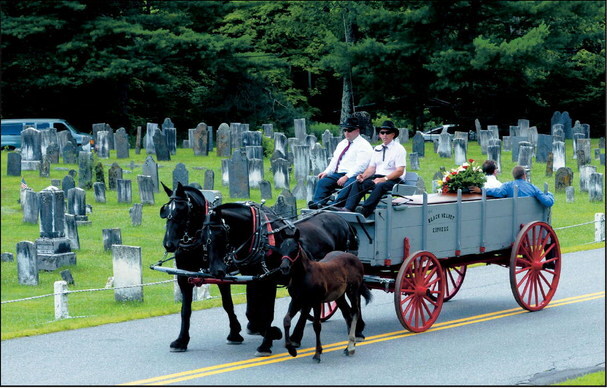 Before her death from cancer, Sullivan told her family she would like to travel by horse and buggy to the cemetery. The two horses and the young foal belong to Sullivan's sister and brother-in-law, Terry and Steve Morse of Whitingham, Vt. The foal is trotting beside its mother.